Since the days of individual cast-metal fonts for each size of your typeface, type-enthusiasts have dreamed of ways of creating nicer, more elegant, more useful, more unique glyphs. Nowadays, you can download hundreds of thousands of fonts, but if none are perfect for you, you can also create your own without the forge and molten metal. However, enthusiasts beware: Even if you're a dab hand at a drawing program, you may find FontCreator ($100, thirty-day trial with limitations) hard to master. After all, typography is an art and a science. 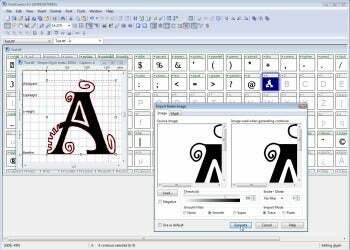 FontCreator is especially good at tracing either raster or vector images, but tweaking those images or drawing one from scratch is considerable more difficult. FontCreator has many buttons; I counted more than 60 in various moveable toolbars. Most (like cut and paste, knife, zoom) are familiar to someone versed in drawing, painting, graphic design, and image editing programs . That said, FontCreator includes so many buttons, it's a little overwhelming to someone starting out. To draw a glyph from scratch, FontCreator uses TrueType conventions that can be hard to master with a mouse (or if you're left-handed). Draw clockwise and you draw the body of the glyph—the part that is filled—raw counter-clockwise to create a cutout within that glyph, like the middle of an O. FontCreator's Change Direction command is one you'll use frequently as a beginner. Unfortunately, Change Direction is one of a few commands that doesn't have a desktop button. FontCreator creates and edits TrueType and OpenType fonts, meaning your fonts are based on the outlines of curves (not pixels), so FontCreator includes tools that help you manipulate those curves. I like FontCreator's red dots used for changing curves, rather than the lines and handles found commonly in vector drawing programs like Adobe Illustrator, and also in Type 3.2 (at $65, a slightly cheaper font editor and creator). However, Type (and its free, limited-functionality sibling Type Light) seems to come better equipped to allow you to draw the perfect curve from the outset, and includes more specialized curve tools than FontCreator. Fortunately, FontCreator also can import common vector files (.ia, .eps, PDF) and bitmap image files (jpeg, png, giff, tiff, etc). This allows you to create your glyph–whether it's a standard keyboard character or a representational dingbat—in a vector drawing program such as Xara Photo & Graphic Designer ($80) or DrawPlus Starter Edition ($60). You can then use FontCreator to manage the technical aspects of creating a font, like setting kerning, standardizing x-height, and packaging. Unfortunately, the trial version of FontCreator doesn't allow you to save, install, or extract fonts (you can, however, use FontCreator to write sample text with your new font). FontCreator doesn't fully support font hinting—the use of a mathematical equation to automatically adjust a typeface so it lines up with a grid of pixels–a necessity if you're creating a small-sized typeface, but not a deal-breaker for bespoke display fonts. However, much like Type 3.2, you can manipulate the gray scale rendering to achieve better effects at smaller sizes. I like the tab system in FontCreator that allows you to have multiple glyphs open at the same time. Also, the glyphs are displayed in a separate full screen tab, which I preferred over Type 3.2's floating box: it just makes it easier to see what you're doing. When it comes to mapping the glyph, Type's click button approach means it's harder to make mistakes. However the cut-and-paste process in FontCreator is intuitive, so when you accidentally draw an M in N's mapped spot, you can just cut and paste it into the right place. Using FontCreator is not hard to get started creating your own typefaces, but you should expect to have a lot to learn. And don't quit your day job just yet: You may not sell the fonts you've created using FontCreator Home Edition, or use them for commercial purposes (like printing on a t-shirt that you plan to sell, or designing a logo for a client). For those uses, you need to purchase $250 FontCreator Professional. If you're planning on using your fonts commercially, you may want to consider $60 Type 3.2, which may not be as slick or as easy, but does include a commercial license.